As of 10:00 p.m. EST Sunday, Tropical Depression Beta was centered near 12.7 north and 85.3 west, or about 70 miles east-northeast of Managua, Nicaragua. Beta is moving west at about 9 mph. Beta continues to weaken and has maximum sustained winds of 25 mph. The estimated minimum central pressure is 1002 millibars, or 29.59 inches of mercury. Early Sunday morning, Beta peaked in intensity as a Category 3, or major hurricane, on the Saffir-Simpson Scale. Beta became the seventh major hurricane of the 2005 Atlantic Hurricane Season. The other major hurricanes so far this year are: Dennis, Emily, Katrina, Maria, Rita and Wilma. The all-time record for the most major hurricanes in the Atlantic basin in a single season is 8 set in 1950. 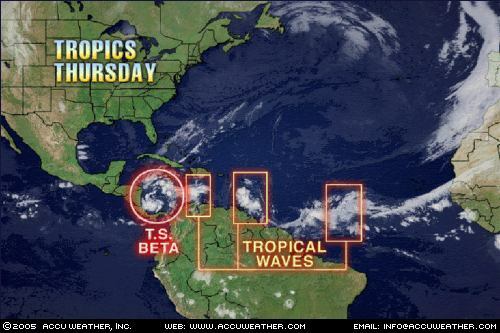 Beta made landfall on the coast of Nicaragua Sunday morning and it has weakened to a depression over central Nicaragua Sunday night. Beta is on the move and it will cross western Nicaragua Sunday night and should move into the Pacific Ocean on Monday, probably near southern El Salvador. It is interesting to note that the latest GFDL model ramps up Beta back to hurricane status over the Pacific Ocean Monday night. Heavy flooding rains will occur over parts of western Nicaragua and Honduras Sunday night and could spread into El Salvador and southern Guatemala Monday. A tropical wave currently across the northwest Caribbean will interact with a stationary frontal zone across the Bahamas and Cuba causing tropical moisture to increase northward into southern Florida on Tuesday. Combine this with a digging upper trough of low pressure across the northern Gulf and moisture from Beta streaming north, and the result could be an area of low pressure near the Bahamas or Florida, or even the eastern Gulf on Tuesday or Wednesday. Whether it becomes a tropical cyclone remains to be seen as there will be plenty of southwest shear from the eastern Gulf across Florida into the northern Bahamas. A tropical wave along 61 west and south of 20 north continues to cause showers and thunderstorms across the Lesser Antilles Sunday night. There is some southerly shear overtop of the wave as an upper level trough of low pressure over the eastern Caribbean backs to the west. This will help ventilate thunderstorms associated with the wave so it will have to be watched for potential development. WASHINGTON -- Two months after Hurricane Katrina, Louisiana's public hospital system is on the verge of financial collapse unless federal aid is forthcoming quickly, the head of the system said Thursday. "We're out of money, roughly after Thanksgiving," said Donald Smithburg, chief executive of the LSU Health Care Services Division told reporters. "We are running out of time." Smithburg said the system, Louisiana's largest health care provider with 1.2 million patients annually before the storm, will have to furlough 2,900 of its 8,000 employees next week, the first step toward permanent layoffs on Dec. 17. New Orleans Mayor Ray Nagin believes that the city will be larger and much safer in as little as five years. Nagin made the proclamation in front of the City Council Thursday as he projected his budget for the upcoming year. While anticipating a much smaller city initially, Nagin believes the opportunity to rebuild New Orleans will result in eventual growth. “Katrina was a moment in time, it has lingering effects but we have the opportunity to rebuild New Orleans,” he said. “(It’s) something that no one else has had the opportunity to do." However, Nagin realizes hard times will precede good times and he said next year’s budget will be approximately $155 million less than this year’s. He attributes the shortfalls to anticipated trouble collecting property taxes and a large decline in tourism, probably to 20 percent of its pre-Katrina level for next year. And he anticipates that the cash they currently have can last them only through March, though he is optimistic that loans and federal grants will bridge the gap. Nagin did add that the eventual growth of the city hangs on one crucial element – better levee protection. Nagin said the levee system must eventually be strengthened to withstand category-5 storms, otherwise efforts to rebuild may be jeopardized. Although more than 200 people packed into a New Orleans hotel room wanted Mayor Ray Nagin to address a sheaf of topics Wednesday, he knew one question was paramount: What is going to happen to my house? Nagin opened his remarks with a complicated answer, leaving some in the audience as confused as ever. Federal officials monitoring the proceeding said portions of Nagin's speech were incorrect. Federal and City Hall officials even disagree on the number of houses facing demolition, with the fate of thousands of residences perhaps hanging in the balance. Embattled Orleans Levee Board President Jim Huey resigned Wednesday amid cries of foul by colleagues that he might have overstepped his authority with unilateral decisions to hand no-bid contracts to relatives in the days after Hurricane Katrina and to collect nearly $100,000 in back pay several weeks before the storm. Huey, whose nine-year-plus tenure at the agency's helm is the longest on record, made no apologies for steering work to members of his wife's family, saying those steps were taken under emergency conditions. As for the back pay, Huey said he was legally entitled to the money. As of 5 a.m. EDT Friday, Tropical Storm Beta was centered near 12.3 north and 81.2 west; this is about 35 miles east-southeast of San Andres Island and 175 miles east of Bluefields, Nicaragua. Beta is drifting to the north at about 3 mph with maximum sustained winds near 65 mph. The estimated minimum central pressure is 994 mb, or 29.35 inches. A hurricane warning remains in effect for the Islands of San Andres and Providencia. A tropical storm warning and a hurricane watch remain in effect for the entire Caribbean coast of Nicaragua from the border with Costa Rica northward to Cabo Gracias a Dios near the Nicaragua/Honduras border; adjacent islands are also covered by this watch and warning. An upper-level ridge of high pressure is sitting right on top of the storm, which puts it in an area favorable for continuing intensification. Beta should become a hurricane over the next 12-24 hours, and could reach category 2 strength (96-110 mph) before making landfall in Nicaragua late in the weekend. 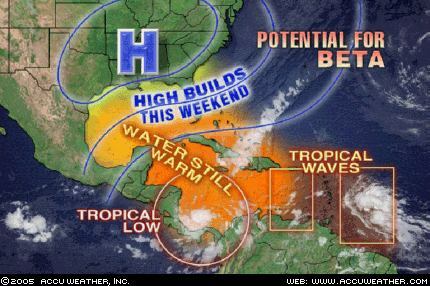 An upper-level trough of low pressure will slowly pass across the Gulf of Mexico over the next day or so and should draw Beta slowly more north than west; a track more to the west is likely over the weekend as the trough moves into the Atlantic and high pressure builds in the mid-levels across the Gulf of Mexico. Heavy rain will affect eastern parts of Nicaragua and Costa Rica, as well as western Panama, over the next couple of days and could lead to major flooding. Strong damaging winds may develop along the coasts of Costa Rica and Nicaragua late Saturday into Sunday. Tropical Storm Beta formed Thursday in the southwestern Caribbean Sea, extending this year’s record of named storms in the Atlantic hurricane season. Beta is the season’s 23rd tropical storm, the most since record keeping began in 1851. The disturbance formed Wednesday night but forecasters say it is not expected to threaten the United States. At 5 a.m. EDT, it was located about 75 miles south of San Andres Island and about 140 miles east-southeast of Bluefields, Nicaragua. A hurricane watch and a tropical storm warning has been issued for the islands of San Andres and Providencia. Heavy rain and strong winds were expected there Thursday. A tropical storm warning has been issued for the entire Caribbean coast of Nicaragua and adjacent islands. Hurricane conditions are possible in the next several days, forecasters said. Its maximum sustained winds were near 40 mph and was moving northwest near 5 mph. Tropical storm force winds extend outward up to 35 mph. Beta is expected to produce 10 to 15 inches of rain across western Panama, Costa Rica and Nicaragua, forecasters said. Last week Tropical Storm Alpha formed, which was the first time a letter from the Greek alphabet has been used because the list of storm names was exhausted. The previous record of 21 storms stood since 1933. From AccuWeather: This hurricane season has been a record setter, and it is not through with us yet. The tropics remain active as this picture shows. The tropical low over the Caribbean has just become Tropical Depression 26 and it is likely to become Tropical Storm Beta on Thursday, making this the 23rd named storm this season. The combination of high pressure building to the north this weekend and very warm water could cause one of the other disturbances to develop as well. Another startling record that was set is that there were three strong category 5 hurricanes, namely Katrina, Rita and Wilma. Ironic that the name of all three storms ends with the letter A. Story by AccuWeather.com meteorologist Brian LaSorsa. After riffling through a thick stack of papers, Charles Wilson pulled out a sheet, marched briskly up to a house, knocked and yelled "Constable!" Hearing no answer, he taped the summons for an eviction hearing to the front door, retreated through the trash-strewn yard and repeated the sequence at a house across the street -- and again at two homes around the corner and down the block. After a 59-day eviction moratorium ordered by Gov. Kathleen Blanco in the wake of Hurricane Katrina expired Tuesday, landlords pressed Wilson and other constables across much of the New Orleans area to remove tenants so they can repair storm-damaged rental properties. A Louisiana environmental group said Tuesday that the cake-like muck that Hurricane Katrina dumped in much of St. Bernard Parish is loaded with toxic substances in amounts exceeding federal and state recommended levels, and the group contends that federal and parish officials are not giving returning residents enough warning about potential health risks. But the U.S. Environmental Protection Agency said it has found no reason to warn of health concerns, and St. Bernard Parish officials said they have told residents to take precautions as needed to return into the area. The criticism from the Louisiana Bucket Brigade came as the group released results from its own soil testing last month in Chalmette and Meraux. Wilma Subra, a technical analyst who reviewed the results for the group, said substances ranging from the carcinogen benzene and other petroleum-based chemicals to toxic metals such as arsenic and chromium were found in excessive levels at 10 of 14 sites sampled.